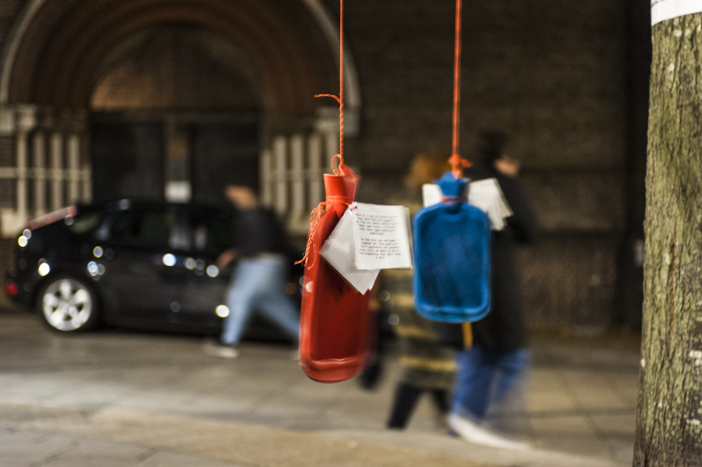 Local people have been distributing hot water bottles to homeless people in Brighton during what looks set to be one of the coldest winters of the decade. 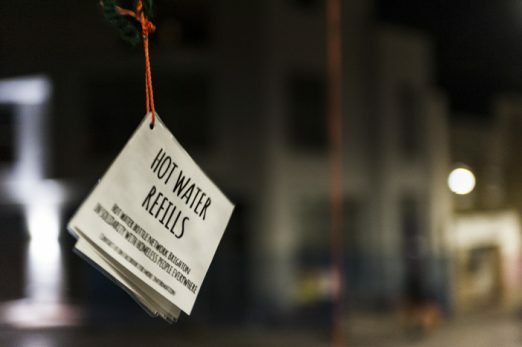 The Hot Water Bottle Network, which has collected and handed out over 300 bottles so far, was set up to provide a simple and direct way of helping people living on the streets of Brighton. 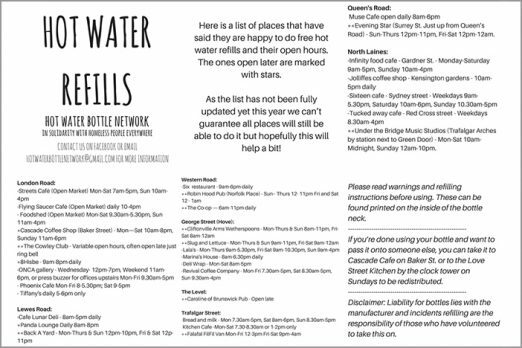 As well as giving the bottles to those who desperately need them, the network has also managed to get numerous local shops and businesses to offer free refills of hot water. The bottles they distribute are all tagged with a label listing where people can get a top up. 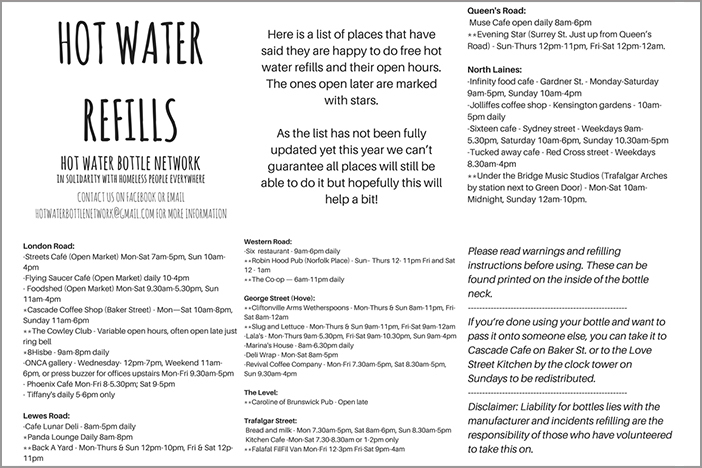 Currently the list includes around 40 outlets, from Infinity Foods Cafe and the Cowley Club, to ONCA gallery and Under The Bridge studios. The bottles are being collected at gigs and parties, and one action involved hanging the bottles from trees – both to raise awareness and get them out there. The rise in numbers has now coincided with a drastic drop in temperatures. Sadly there are already examples of what this can lead to. At the end of October, a 21-year-old homeless man called Rob was found dead under Madeira Terrace. Brighton and Hove has seen the UK’s biggest increase in homelessness over the past year with 4,074 people in the area in temporary accommodation and 144 on the streets. That translates as one in 69 Brightonians with no home. A recent BBC Three documentary depicted the grim reality for women living rough in the city. Brighton & Hove Council is now using the Brighton Centre as an emergency shelter. A room in the council-owned building was opened on Sunday and will provide accommodation for up to 30 people until February. The council say they are looking at opening other spaces for people to stay. However, some have criticised the council for not doing enough – and in some cases for actively targeting the homeless. There are even rumours that local binmen have been ordered to confiscate the belongings of rough sleepers. And earlier this month a private security company contracted by the council turned up on the Level to stop some homeless people cooking sausages in the rain. Frustration with how council funds are being used is probably one of the reasons why so many local groups have sprung up to help the homeless. Love Activists run regular soup kitchens, Brighton Homelessness Action Group are distributing ‘winter survival kits’ and The Brighton Community Night Shelter have plans to construct a large marquee to provide a year-round safe space. Meanwhile, The Clock Tower Sanctuary is running a ‘They Are Out There’ fundraising campaign to give young people a place to stay for Christmas. The Hot Water Bottle Network in Brighton has inspired others to set up similar schemes in cities as far afield as Birmingham, Glasgow, Bristol, Leeds and Manchester. Though local grassroots groups can’t really solve the systemic and underlying causes of what is actually a nation-wide problem, the actions of these volunteers are already having an immediate and tangible effect on the lives of those they help. 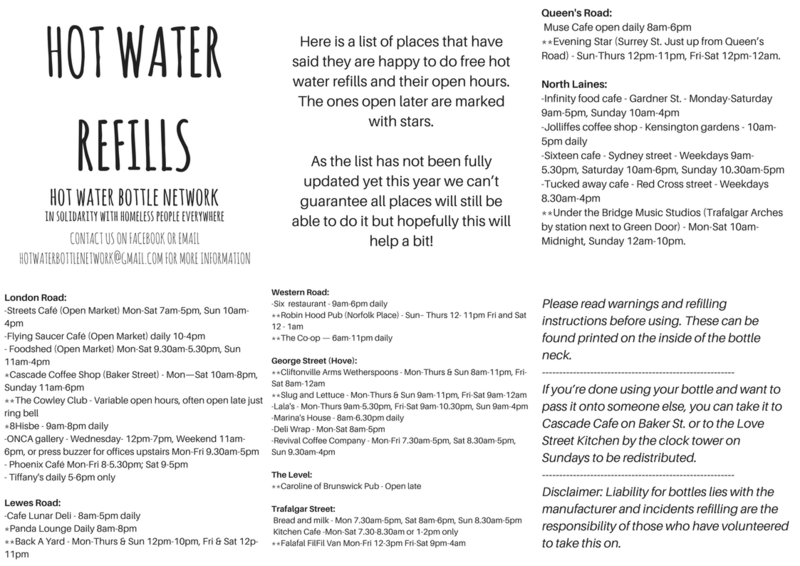 Get in touch with the Hot Water Bottle Network if you’d like to donate some bottles, offer refills from your shop or business or get involved with the tagging and distribution.